To have enough soldiers and weapons is not yet all what is needed for the victory. In the beginning of the war the German Army had less tanks and people than the Red Army but had the superior tactics. Order on fighting German tanks. Instruction on fighting Tigers The situation changed later in the war. The Red Army regained initiative in strategic operations in tremendous battles of 1943 and learned to use the quantity to reach the tactical superiority on the battlefields. 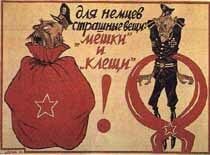 The propaganda banner shows the main approach of the Red Army to the offense. The painfully gained experience taught the hot tempered commanders that the frontal attack of the prepared defense hurt dearly. The instructions and orders demanded, whenever possible, to cut the German troops off by attack on the flanks, surround them (sack on the picture) and destroy.